Your teeth plays an important role in chewing, speaking and in maintaining a proper alignment of other teeth. As the age advances people lose teeth, they must be replaced to maintain proper functioning of your mouth. If one of your teeth affected by decay(cavity), cracks, chips and any other forms of damage, dental crowns provide an ideal situation. Crowns offer both cosmetic and dental health benefits, reinforcing the structure of a tooth while making you smile natural again. Crowns are custom-made to blend naturally into each patient's unique smile. Crowns are crafted to complement the surrounding natural tooth in terms of color, shape, size and to restore integrity to patient bite. Dental crowns are also used to secure artificial teeth as part of dental bridge and in some cases, crowns are attached to dental implants to replace missing teeth. The procedure usually involves minimum two appointments. Cover a tooth that has had root canal treatment(RCT). 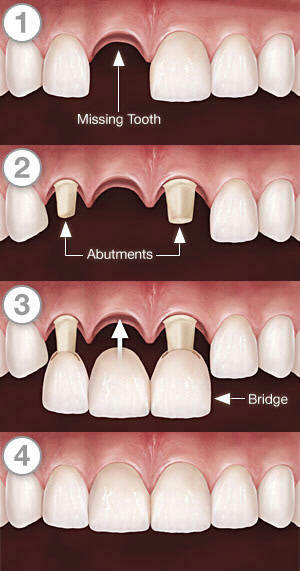 Bridge may be recommended if you're missing one or more teeth between existing natural teeth or implants.